Supported by our local marxists of course. The Tamil Tigers or Liberation Tigers of Tamil Elam are widely recognised as a ruthless terrorist group-one of the few non Muslim terror organisations to routinely use suicide bombers. The LTTE has an huge international support network, which has been suppressed in many Western countries but remains relatively unhindered in New Zealand. This interview with a young New Zealand LTTE supporter, Nirupa George, by Trotskyist leader Joe Carolan, gives some insight into the "sense of grievance" and bitterness of some Tamil New Zealanders. It is also a warning that New Zealand is not as immune from the extremism that drives much third world terrorism as most of us would wish. Carolan Nirupa, when did you first become an activist for the Tamil cause? George I would say I really became involved after I visited Sri Lanka in 2003- my extended family still live there- I never really had a chance to get to know my extended family due to limited contact due to the war, so really my motivation is not because I have family there but because all Tamils are my kith and kin. Carolan Is there a big Tamil community here in NZ? George There is a relatively large community- in total, over 5000 in NZ, and of that 3000 in Auckland. Carolan How do you see yourself politically? George Politically, I do not lean right, I am left wing and I support any oppressed people. Carolan How did the present conflict in Sri Lanka begin? George The conflict began, in essence with the divide and rule policy of the British colonialist that built up a racial divide between the two races, Tamil and Sinhalese. Carolan Like Ireland, India and Pakistan, Israel and Palestine? George Yes exactly, and after they left, they left the government in the hands of the Sinhalese who then embarked on an oppressive regime. Carolan Tamils were a minority in the new state- how were they discriminated against? George There was government job discrimination, where Tamils weren't given jobs for being Tamil. Then legislative discrimination, such as in education- in 1972 there was standardisation against Tamil students for Uni entrance, and they made over 1 million Tamils stateless by revoking their citizenship via statute- they also made Sinhalese the only official language. This was all of course before they got into the genocide of Tamils- this was the so called 'lawful' discrimination- used to fuel hatred. Carolan Sri Lanka was once famous throughout the world for having a large, revolutionary socialist party that united Tamil and Singhalese workers. How did this give way to racism and Singhalese chauvinism? Unions and activists were brutally shut down, and such activities, were done by the government, but were used as propaganda to incite racial hatred. Carolan It seems there was a strategy in Sri Lanka to divert the anger of the working class away from revolutionary socialism and into nationalist chauvinism. George Yes, because they are well aware that socialism will unite the people, so they divide and rule. Carolan Is there much of a Sinhalese community here in Aotearoa? Are they racist towards you? George There is a community here, and they are not openly racist. But we have it on good authority they oppose the self determination of the Tamil on a political level. Carolan Is there a divide within the Sinhalese people, and opposition to their murderous government? George Hardly, none that we have seen. We have never had the Sinhalese community here support us in opposing the Sri Lankan government. Carolan What were the events and oppressions that led to the armed struggle of the Tamil people? Was there a specific event in the 70s, like Bloody Sunday in Ireland? George They shut down peaceful marches and protests. In 1974, the Tamil world conference was disturbed and many Tamil academics where murdered, and in 1977 there was a large riots in which many Tamils were systematically murdered., and on top of that, the killings of Tamil leaders who advocated for Tamil rights. Carolan What is the current situation in Sri Lanka and what is it like for the Tamil people there? George The current situation in SL is that the Sri Lankan Army (SLA) have set up 'safety zones', areas which they claim civilians are safe in. But the truth of it is that these safety zones are actually open prisons were Tamils are trapped and then murdered by continued shelling and artillery attacks. The so called 'safety zones' are just elaborate fronts to give the international community the impression that the SLA is protecting the civilians, but really they are orchestrating a mass murder campaign. We know that at least over 400 people have died in the last week or so but it is almost impossible to confirm exact numbers as there are no independent Media in the area as the government won't allow them in. There are also no NGO groups in the area so a lot of the government atrocities are going unquestioned. Carolan Is that why civilians are now fleeing with the fighters into the jungles, leaving ghost towns behind them? George Yes, because the SLA has a long and recorded history of killing Tamils so people do not trust them, and they have been proven right by all the killings that have happened recently. They are safer with the LTTE so they would rather go live in the jungle with fighters who look after them. Carolan What is the history of the LTTE? George The LTTE is a people's movement- it was started by the people for the people. After all the oppression they faced and they felt they had no choice but to take up arms as peaceful measures had failed. The LTTE has always advocated for the rights of the Tamil people- they have protected the Tamil people, especially after events like the tsunami. They provided food, aid, medical help, shelter and so forth when the government abandoned us. Carolan And they are opposed by powerful international forces as well as the SLA? George Yes, all countries have a vested interest, for example India and the USA. Carolan Would an independent Tamil state be a threat to them? Carolan If the LTTE are militarily defeated, the resistance of the Tamil people will continue against an SLA occupation of their land? Carolan What can we do here in Aotearoa in solidarity with the Tamil people? George Most importantly, raise awareness, because so many people don't know due to lack of media reporting. Also talk to your local MP and write to the foreign minister. And join us on Feb 4th to show the government that you support us- urge the govt to condemn the Sri Lankan government's genocide. Urge NZ to help Norway push for peace, and to stop cricket tours of Sri Lanka or the Sri Lankan team visiting. Carolan Do you have much faith in Western governments aiding the Tamil people, really? The same people who support the USA, Israel etc? George I personally have lost a lot of faith, but I remain hopeful. Carolan Where is the demo on Wednesday Feb 4th? George At Aotea Sq, starting at 3PM-7PM a march at 5PM, also there are protests in Welly and Christchurch. 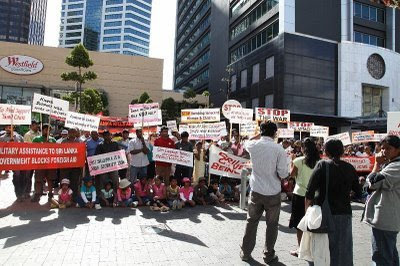 Carolan Socialist Aotearoa support the right of the Tamil people for national liberation. We will be there. Sorry about that Asher, I didn't even think of it. If I need to again, Ill give you a heads up. Hmm, wonder why the Spanish government isn't after the Sri Lankan government like it is against Israel? Me thinks it's hypocrisy going on. This is hillarious.... over 20K people have escaped the clutches of the brutal LTTE in the past few weeks. Yesterday 16 people were gunned down by the LTTE as they were trying to escape. The day before that an LTTE scuicide bomber killed 28 civillians including women and children who have come to the government controlled areas. Anyone who supports the LTTE are traitors to the Tamil people and only seek power and money for selfish reasons. That is why all moderate tamil politicians were assasinated by the tigers. Here is footage from the "peacful" protest on the 4th of Feb 09.